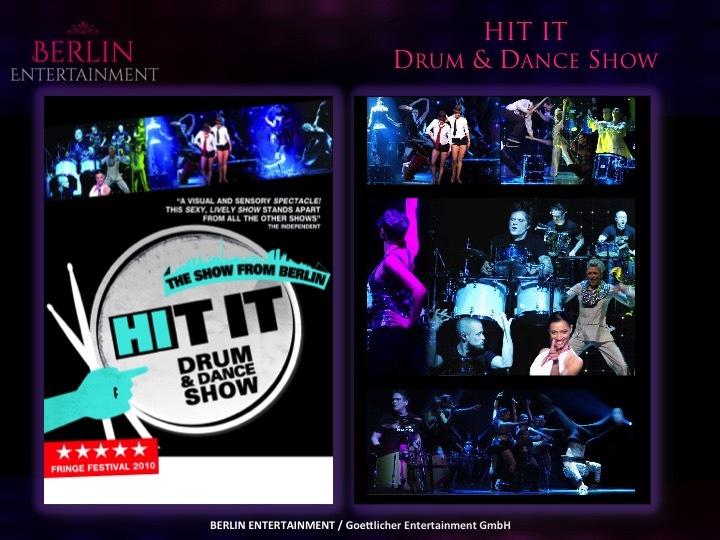 Hit-it pays homage to the jazz- and pop drums, whose development started more than 100 years ago, when the first drummers stepped out of their marching bands and started to accompany other musicians and bands. 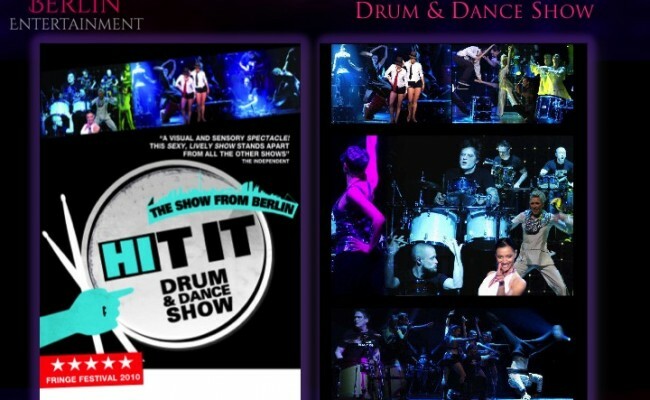 The drummers of Hit-it play standing modern grooves on specially developed drum sets, dancers unify elements of modern-, street dance and break dancers set acrobatic highlights. 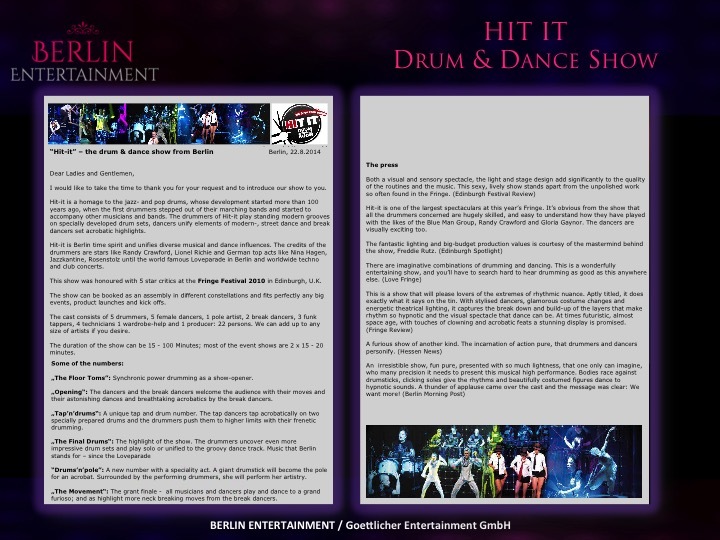 Hit-it is Berlin time spirit and unifies diverse musical and dance influences. 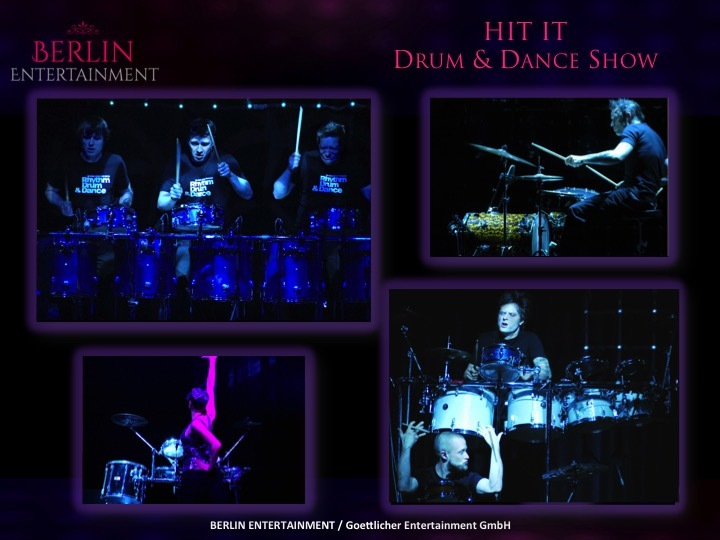 The credits of the drummers are stars like Randy Crawford, Lionel Richie and German top acts like Nina Hagen, Jazzkantine, Rosenstolz until the world famous Loveparade in Berlin and worldwide techno and club concerts. This show was honoured with 5 star critics at the Fringe Festival 2010 in Edinburgh, U.K. The show can be booked as an assembly in different constellations and fits perfectly any big events, product launches and kick offs. 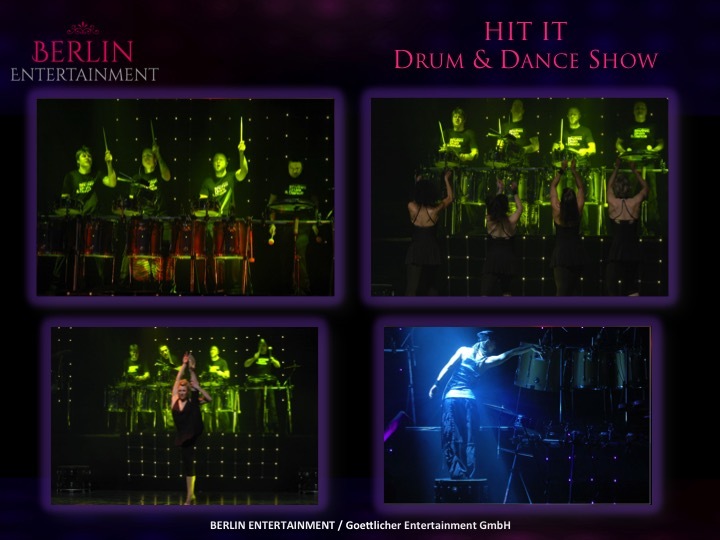 The cast consists of 5 drummers, 5 female dancers, 1 pole artist, 2 break dancers, 3 funk tappers, 4 technicians 1 wardrobe-help and 1 producer: 22 persons. We can add up to any size of artists if you desire. The duration of the show can be 15 – 100 Minutes. „The Floor Toms”: Synchronic power drumming as a show-opener. 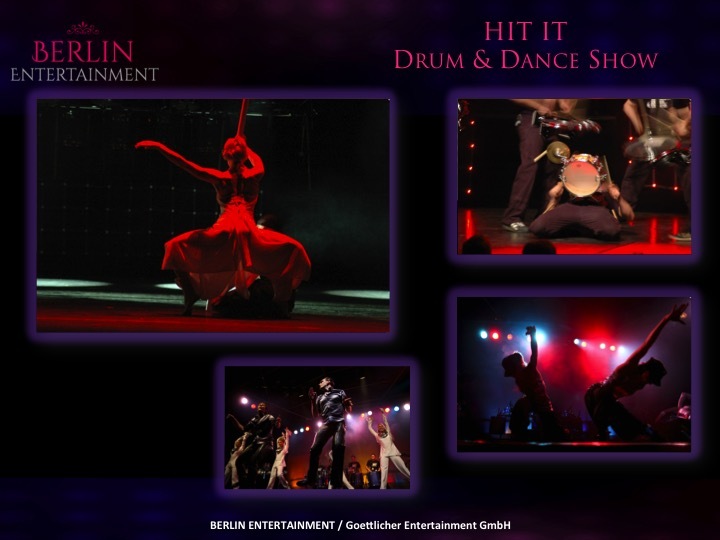 „Opening“: The dancers and the break dancers welcome the audience with their moves and their astonishing dances and breathtaking acrobatics by the break dancers. „Tap’n’drums“: A unique tap and drum number. 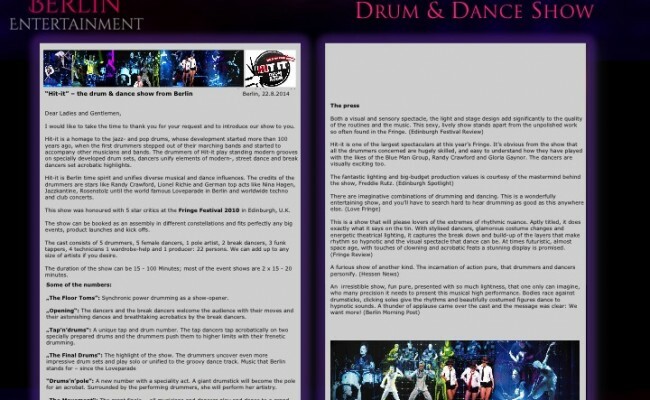 The tap dancers tap acrobatically on two specially prepared drums and the drummers push them to higher limits with their frenetic drumming. stands for – since the Loveparade. “Drums’n’pole”: A new number with a speciality act. A giant drumstick will become the pole for an acrobat. Surrounded by the performing drummers, she will perform her artistry. 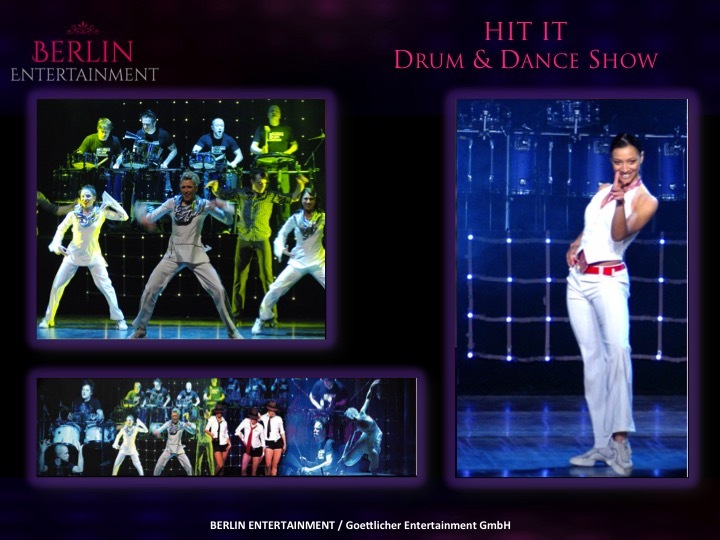 „The Movement“: The grant finale – all musicians and dancers play and dance to a grand furioso; and as highlight more neck breaking moves from the break dancers. 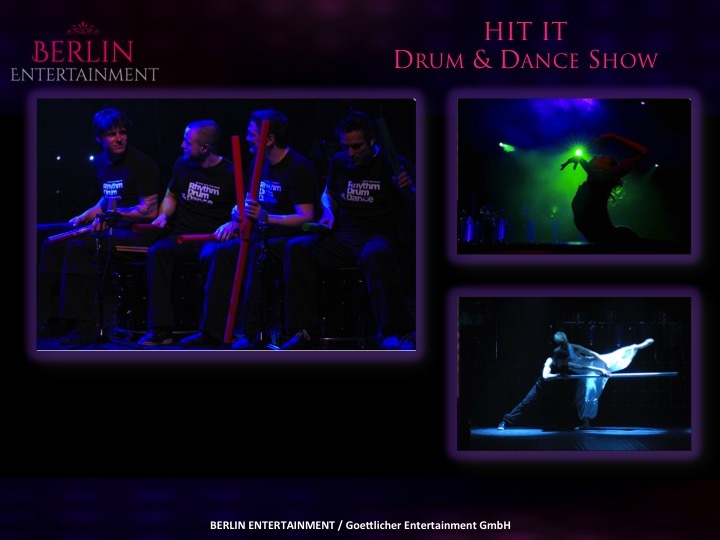 Hit-it is one of the largest spectaculars at this year’s Fringe. 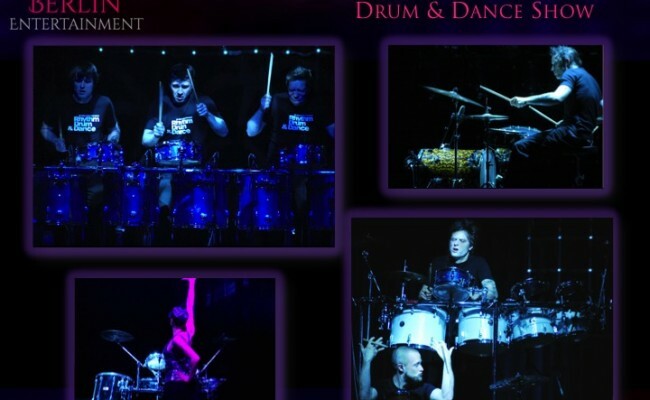 It’s obvious from the show that all the drummers concerned are hugely skilled, and easy to understand how they have played with the likes of the Blue Man Group, Randy Crawford and Gloria Gaynor. The dancers are visually exciting too.